I recently wrote about Burkean pragmatism as opposed to either liberal or conservative approaches. Some weeks back I also wrote about Compassion as Luxury. In the latter, I noted how nomadic herders, the Bakhtiari, had no time for compassion; when the old could no longer keep up and contribute, they were simply left behind to die. The nomads are highly conservative. As the rest of the world evolved into cities and democracies and spaceships, the Bakhtiari still work their flocks in exactly the same way that they have for thousands of years. They have no luxury, no excess. Doing something different from the way it has always been done could spell disaster and death. So they have no excess for compassion, they have no excess for experimentation. They have no excess for tolerance. My area of biology, what I call organic behavior,1)In the past it has been called ‘ethology’ and ‘animal behavior,’ but is currently called ‘behavioral ecology.’ The name reminds me of Bilbo Baggins eleventy-first birthday speech, because I’m still not sure what to make of it. shares many theories with economics. In fact, one of the most important ideas to biological change, including the small evolution that is acceptable to creationists, is the concept of risk prone vs risk averse. You do not need to immediately understand the terms, because we are all familiar with the phenomena. For example, when we have enough time to drive somewhere, we are risk averse, conservative, and we stick to the familiar route. But when we are running late, we may become risk prone, liberal, and start looking for ways to save time. That means we drive faster and a little more recklessly. And we are more likely to try shortcuts, to look for new solutions. Necessity, it has been said, is the mother of invention. When the outcome looks bleak, we should try new things, we should become risk prone. Most of the time we will fail, which is where the ‘risk’ comes in. The wise pragmatist will stick to conservative behavior until there is sufficient reason to change. Occasionally when we try shortcuts, however, we succeed, we shave off some time. We find a new solution. Driving is an admittedly tame example, but we can see the same concepts in warfare and football games. When you have a good chance of winning, stay disciplined, stick to your game plan. But when you’re losing and everything’s on the line, bench the conservative approaches and throw a Hail Mary pass or run a Hook & Ladder drill. Do crazy, risky, low-yield things. Remember the WWII pilot, Thomas Lupo? When traditional approaches aren’t working, screw orders. Improvise. Humanity, however, has a third scenario that is pretty much unique in the history of the world. Humans are the only animals that can store huge excess resources, luxury. In fact, we can store excess in vast enough quantities that we don’t have to worry about working again, ever. Maybe not even for generations: Bill Gates can fully support all of his descendants to come for at least a couple of centuries. That level of excess admits another strategy. Humans can be risk tolerant, or even risk immune. We don’t always try things because we’re desperate, but simply because we can afford to. And at times, to remain competitive we will have to become risk obligate. Next up: Tolerance as Necessity. 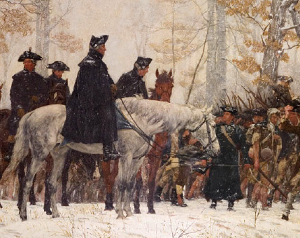 The March to Valley Forge by William Trego courtesy of MountVernon.org. 1. 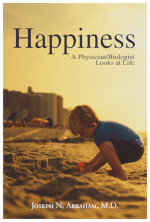 ↑ In the past it has been called ‘ethology’ and ‘animal behavior,’ but is currently called ‘behavioral ecology.’ The name reminds me of Bilbo Baggins eleventy-first birthday speech, because I’m still not sure what to make of it.